As 2014 comes to a close, we want to remind everyone of some great nutrition and cooking tips for your family’s 2015 resolutions! These tips are simple and specific enough that they can be clearly implemented. Engage your whole family in these ideas, and everyone is more likely to keep with them for the whole year! Get Your Kids More Involved in the Kitchen. Getting your kids involved teaches them to develop healthy eating habits, and most importantly, it allows some quality family time to create special memories in the kitchen! In addition, let your children decide on a meal one day a week. Have them help you pick out a recipe and the ingredients. This way they can feel that they are a part of the process as well! Although we all have our favorite foods, introducing and embracing new healthy foods is extremely beneficial! Not only will these provide different nutrients for your family, but it will also shake up their eating routine. Keep in mind that kids are more likely to enjoy a food after they have tried it more than five times. So even if that turnip doesn’t sit well with them the first few times, don’t give up! They will learn to enjoy it. We love this goal because it focuses on the positive aspects of making healthy changes, not limiting or restricting certain “bad” foods. Let your child eat as much as they want during meals and snack time. Although it may be difficult as a parent to not control your child’s eating habits, they will soon learn, on their own, to eat until they are satisfied. Eat with your children and discuss flavors, textures, and aromas of the food. Educating your children to trust their own instincts will allow them to learn to regulate their own eating and ultimately lead to healthy eating habits and creating positive associations with food. We know this one is tough. We all want our children to love vegetables and healthy foods. But sometimes, it just isn’t that simple! However, when you bribe your children to eat healthy using incentives such as desserts or extra play-time, kids end up seeing the fruit or vegetable as the “yucky” item they must consume in order to get their reward. Children start to associate eating these healthy foods with external rewards, such as dessert, instead of internal rewards. However, if we took the time to describe to our children how fruits and vegetables are not only necessary, but extremely beneficial, to consume, then we may not need bribery at all! This type of food and nutrition communication is imperative in getting our kids to eat healthier, and love it at the same time! Take these simple changes into mind when planning what type of year 2015 will be for you and your family. We’re wishing you a happy and healthy 2015! It’s hard to find time to spend with your kids in a day filled with work, school, and other activities. So, when it’s time to make a meal, get your kids involved and spend some quality time in the kitchen with your family! Instruct children to safely use kitchen utensils, such as knives and blenders. Introduce children to different dishes and foods from all around the world and explain where the food originated from. Growing your own produce will allow kids to learn important concepts about how vegetables and fruits are produced and cultivated. Teach your children to develop healthy eating habits. And most importantly, spend family time and create special memories in the kitchen! Preheat oven to 300 degrees then line a baking sheet with a silpat or parchment paper and set aside. 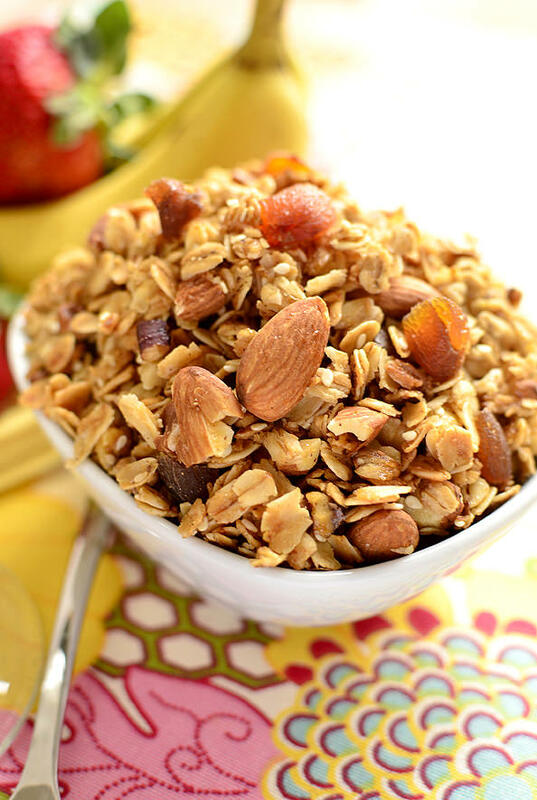 Combine oats, 1/2 cup almonds, pecans, sesame seeds, salt, and cinnamon in a large bowl. Roughly chop remaining almonds then add to the bowl and mix to combine. In a small saucepan, melt coconut oil in maple syrup. Once melted remove from heat and stir in vanilla and almond extracts. Pour into oat mixture then stir until well coated. Spread mixture onto prepared baking sheet then bake for 25-30 minutes, stirring halfway through, or until granola is golden brown (granola will not be crunchy when hot.) Cool completely then stir in dried fruit (if using,) and store in a container with a tight-fitting lid at room temperature for up to 2 weeks. Combine all ingredients together and blend until mixture is smooth and creamy. Add additional water, lime, and or hot sauce to taste. Transfer mixture to a jar and keep chilled until use. Toss lettuce, corn, black beans, red pepper, tomatoes, green onions, and radishes with enough avocado dressing to fully coat the mixture. Fold in chopped avocado and divide salad between 4 large bowls. Serve with a handful of tortilla chips in each bowl and top with additional chopped cilantro for garnish. Choose and develop a yummy recipe to make and pick out the freshest ingredients! Inspire your kids to love healthy food and cooking by teaching them kitchen essentials at a young age! We all know that feeling of hunger. Gnawing and grumbling in your stomach. Time to grab something to eat! But how did you first learn those feelings of hunger and satiety? Most infants are actually in tune with their body’s natural response if they’re hungry or full. However, some parents may unintentionally disrupt this response when their child is very young. When parents say things such as “just a few more bites and then you can be done,” they have positive goals in mind. They want their child to get enough to eat or make sure they’re eating their vegetables. However, pressuring kids to eat more when they have stopped eating may have negative impacts. If the child is in fact full and they are being pressured to eat more, then the child may learn to ignore their body’s hunger cues. As a young child we are all taught that we must listen to our parents. So when they tell us we need to eat more, we respond accordingly. Yet, this can lead to overeating and eating in the absence of hunger. So, as a parent, how do you ensure that your child has eaten a sufficient amount, while teaching them to pay attention to their internal cues? Create a meal schedule for your children so they know when food will be available. Along these lines, only allow snacks once between meals if your child is hungry. Reduce mealtime distractions, such as television and cell phones, so children can pay attention to the food they’re eating and how they feel. With all the pressure to eat more food and less healthily, teaching your kids to respond to their natural internal cues is vital for their future. Educating your children to trust their own instincts will allow them to learn to regulate their own eating and ultimately lead to healthy eating habits and creating positive associations with food. As the weather continues to cool down, families may be spending more time playing games and reading books to the little ones inside to keep warm. One great option to warm up on chilly nights is to make a slow cooker dinner. Placing all the ingredients into your soup pot or crock-pot and then allowing the dish to simmer uninterrupted for while allows you to create an easy but tasty meal. This also lets you spend more time connecting with the family while dinner basically cooks itself. The dishes below are great options to try this season and all members of the family can enjoy them together. This dish is a simple yet tasty dinner, and, depending on the age of your youngest child, the cook time can be altered to make the ingredients softer and easier for infants and toddlers to eat. Add all ingredients to the bowl of a slow cooker. If needed, add more stock so that the beans are covered with liquid. Cook on low for 10 hours or high for about 6 until the beans are tender. Taste the beans, and add as much salt as you'd like. This recipe is perfect for those families with infants just starting to eat soft purees. Even for those families without them, this dish is quick to throw together and yummy as well. Place the sweet potatoes, vegetable broth, onion, garlic, and spices in a crockpot. Cook on high for 3 hours, until vegetables are soft. Add the lentils and stir once. Replace the lid and cook on high for an additional 1½ hours. Stir in the coconut milk and as much water as needed to get the right consistency. Another delicious option that cooks a bit faster than the other recipes is this hearty vegetable soup. Again, cook time can be altered to better fit your little ones needs. Preheat a soup pot to medium heat with the olive oil. Add the onion with a sprinkle of salt and pepper and cook for 3 minutes. Add the potato with more salt and stir to coat in the olive oil - cook for 3 minutes more. Add the garlic to the vegetables and cook for 1-2 minutes, just until fragrant. Sprinkle the flour over the potato mixture and stir it into the vegetables. Add the vegetables to the pot, and squish the tomatoes into the pot with your hands. Add the stock, and stir the soup to combine everything and pick up any bits from the bottom of the pan. Increase the heat to medium-high and cover the soup to bring it to a boil. When the soup boils, reduce the heat to medium-low and simmer the soup for 20 - 30 minutes until the potatoes and other vegetables are tender. Taste, and add more salt or pepper to the soup as desired. To serve, add a handful of spinach leaves to the bottom of a bowl. Top with soup and add any desired toppings. Have you tried these recipes or have a personal favorite slow cooker meal? Let us know in the comments below!